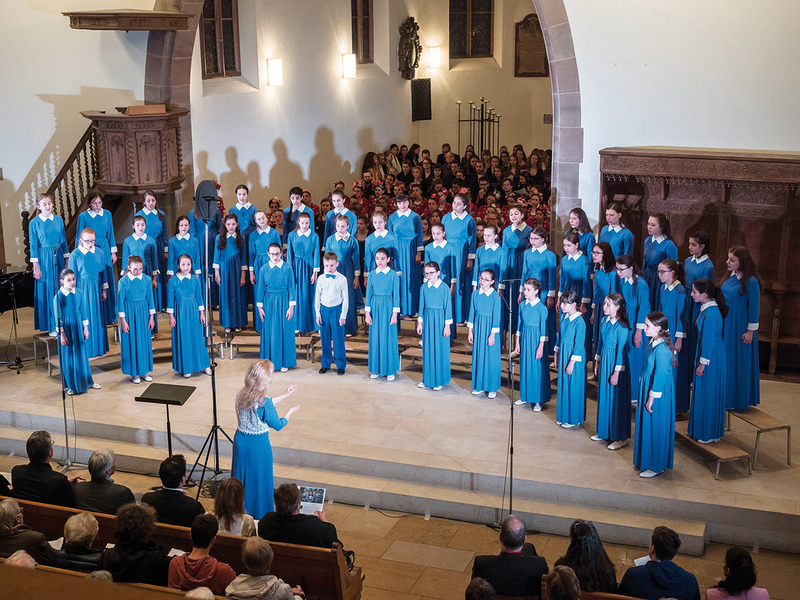 Any chorister should consider being born in Basel a stroke of luck, thanks to the commitment of the ‘European Festival of Youth Choirs’ organizers. 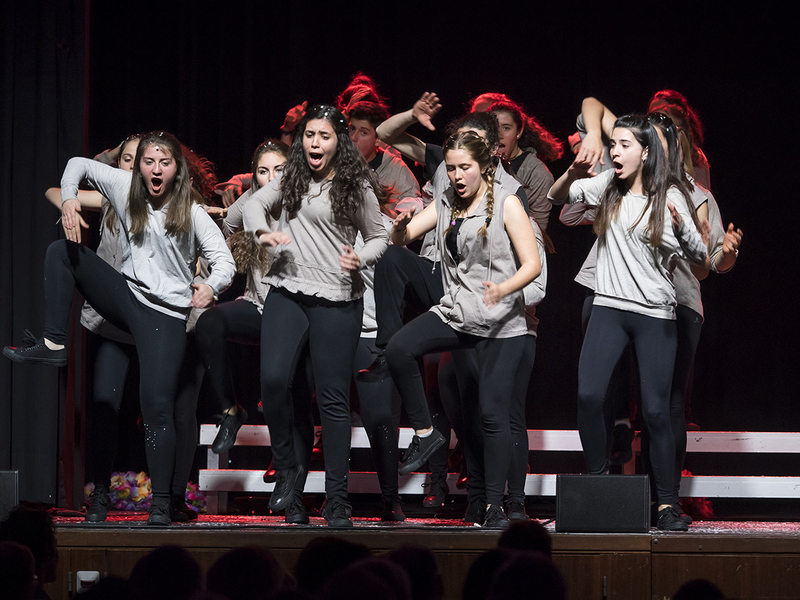 In 1992, they began a policy of choral singing education that has transformed schools and generations of young people throughout the whole region. The 10th edition of this event has emphasised how dedicating attention to the development of new artistic collaborations, as any festival should do, is a simple but effective formula for success. 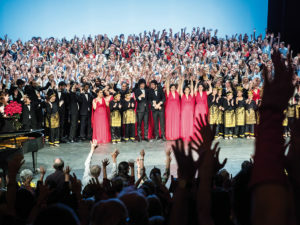 For a few days, foreign choirs (from the likes of Belgium, Spain, Indonesia, Sweden, Norway, Georgia, Turkey, Greece, Bulgaria, The Netherlands and Russia) worked together with host choirs from the area, creating cultural exchanges and fostering the growth of young Swiss people. Through this experience, the young people have had an opportunity to understand how music may form a basis for them to overcome the fear of different cultures, to appreciate diversity and to feel nearer to people who have come from so far away. A new wealth of schools and young choirs have also bloomed all over the region due to the growing interest over the 10 editions of the festival, whilst the experiences made possible by the festival also drives them to continuously excel. I would also say that this growth is caused by the interest and enthusiasm generated by the many young singers in the city streets. Those that grow up within the Basel school system are given an opportunity, which is largely accepted and produces great results, to experience choral music. 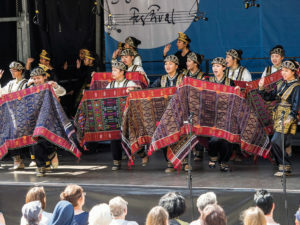 Today the Swiss township, that historically has been a crossroads for commercial exchanges between France and Germany, is expecting the choir invasion to highlight to young people how cultural exchange is contributing to Basel becoming a real model of civilization and hospitality. However, when you are living in such a favourable environment you are also pressed to seek more stimulating adventures in the artistic areas, both for the interest of the public and for investors. The jubilee edition has presented three very interesting projects, the first of which was dedicated to composers. Four foreign composers were selected and each were given a Swiss folk song that they were to arrange by inserting sounds from their own genre of folk music, thus achieving a genuine fusion of musical cultures. These songs were first performed in a concert named ‘The Colours of Cultures,’ which was a great success both for the number of attendees and for the composers Maestro Stoyan Paurov (Bulgaria), Frank Havrøy (Norway), Hans Cassa (The Netherlands) and Hasan Uçarsu (Turkey). 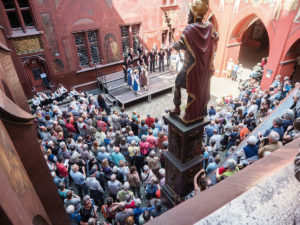 The second project was dedicated to the Mozart Requiem in a version named ‘Sing Mit!’, in which all attendants were invited to bring their own score and to sing along with the orchestra in a very crowded square. This was an extraordinary Requiem performance in a city where everybody, or at least very many, have a Mozart score at home! The third project, more interesting from a managerial point of view, was demonstrating how a commitment in culture, if well addressed, could attract investors and sponsors. 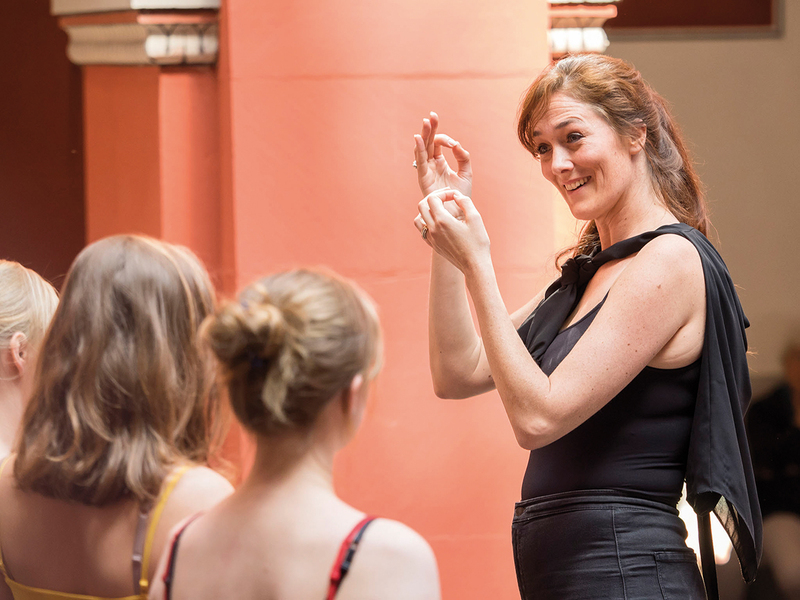 ‘Start Up for Young Conductors’ is a project financed by a local foundation that provided seed capital to 10 young conductors from different European Countries to attend the festival. 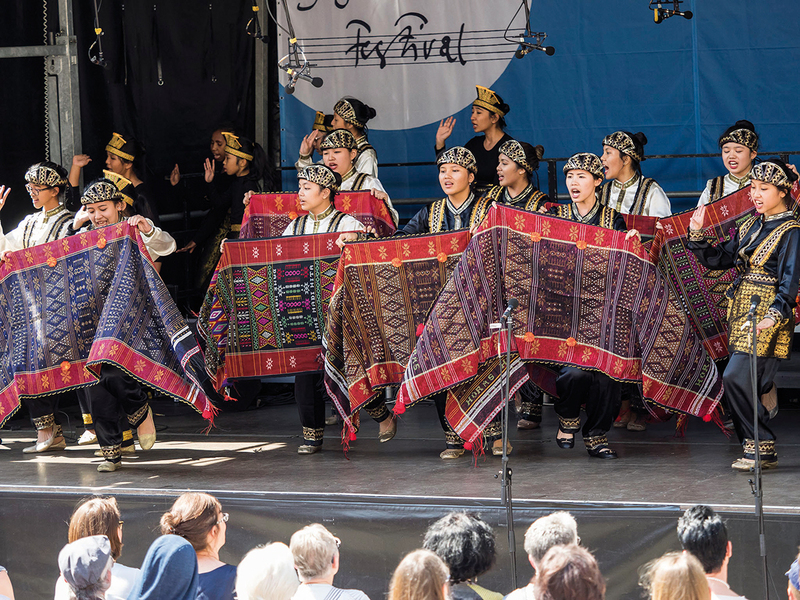 They were to examine the festival’s activities and return home to set up, with financial support, the same festival format or choral projects in their own country. But the agenda of the ‘European Festival of Youth Choirs’ was not limited to these projects: the programme was also full of appointments filling the days around the Pentecost with musical emotions. 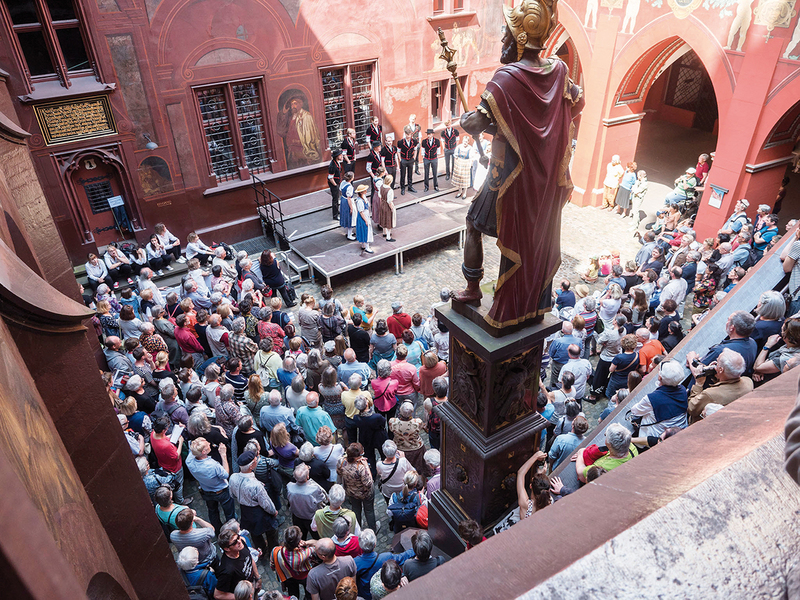 All the concerts performed the in churches and theatres of the city and the region as a whole were sold out and were of a very high standard, including a culmination in the afternoon named ‘Sing uf dr Strooss’. 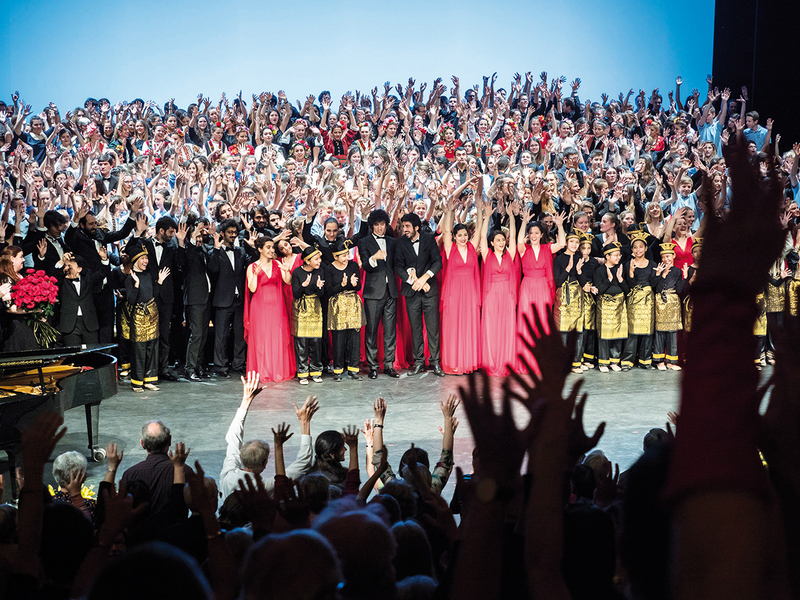 For three hours, choral music resonated throughout the city centre as all participating choirs performed on 5 stages set up in Basel squares. These results that I have described were due to the festival’s very high musical and managerial standard. Hence, I would strongly recommend to everybody to take the time to pay a visit to Basel during this festival (if you are not already living there of course). This experience will demonstrate how choral music can affect a whole region for the better. 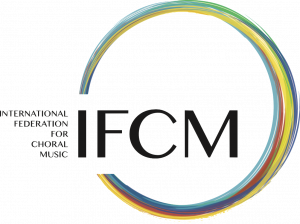 A region that has always been very attentive to young people’s development and to music, but that has, for the last 24 years, been using choral music as a means for social inclusion and for diversity education by meeting with other cultures.